A giant villain-defeating, noodle-loving panda is practicing kung fu in the Talmage Building. 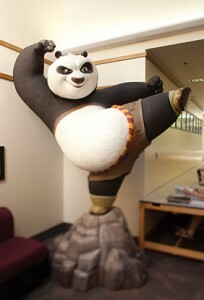 The 8-foot-4-inch statue of Po from Kung Fu Panda previously protected the foyer of a DreamWorks Animation studio; that’s where computer science chair Parris K. Egbert spotted him back in 2008. DreamWorks vies for BYU animation grads, and Egbert and other faculty members were there visiting contacts and former students. They asked about the panda’s fate after the film had its run—and found out Po could call BYU home. After all, alumnus Jason C. Turner (BFA ’95) was the modeling supervisor for the Kung Fu Panda films. “It’s like I build the puppet and I hand it off to the puppeteer,” says Turner, whose team created the digital model of Po before handing it off to the animators. Turner has his own Po statuette at home.